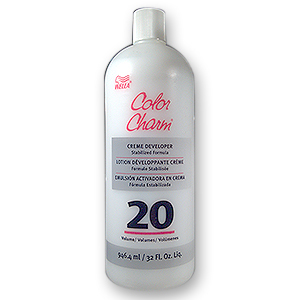 Color Charm 20 Volume Crème Developer is a specially stabilized developer formulated for use with all permanent haircolors when covering gray/white hair or lightening the natural hair color. For best results, follow manufacturer’s recommended mixing instructions. Water, Hydrogen Peroxide, Cetearyl Alcohol, Styrene/VP Copolymer, Disodium Phosphate, Sodium Lauryl Sulfate, Salicylic Acid, Phosphoric Acid, Sodium Laureth-40 Sulfate, Sorbic Acid.